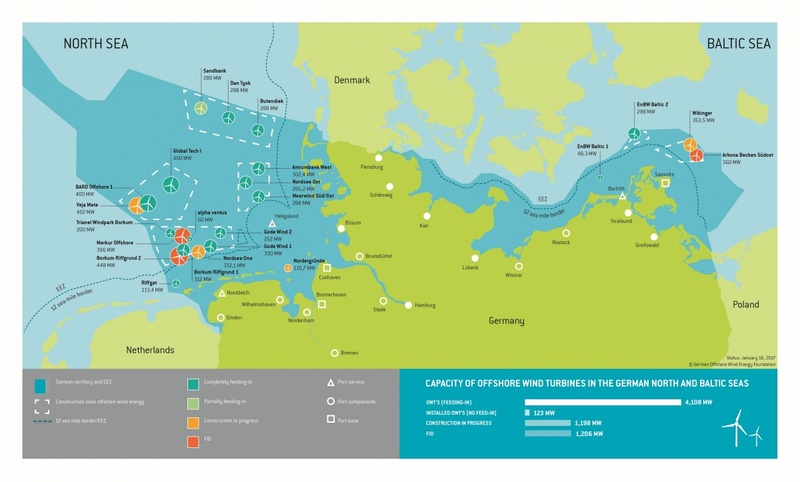 According to the latest figures published by Deutsche WindGuard, 1,305 offshore wind turbines with a total output of 6,382 MW (megawatts) fed into the grid in 2018. In this period, 136 new turbines with an output of 969 MW were connected to the grid. This confirms the forecast made last year by the industry associations. In addition, 276 MW were fully installed but have not yet fed into the grid. Furthermore, a capacity of 966 MW is currently under construction. The final investment decision has been made for another 112 MW. The legally permitted expansion of 7.7 GW (gigawatts) by 2020 will therefore probably be achieved as planned. According to an analysis of Deutsche WindGuard, a total of 1,169 wind turbines with an installed capacity of 5,387 MW were connected to the grid on 31 December 2017. Following the figures from AG Energiebilanzen, offshore wind turbines increased their power generation to 18.3 terawatt hours in 2017. That is almost 50 percent more than in 2016 (12.3 terawatt hours). Andreas Wagner, Managing Director at the German Offshore Wind Energy Foundation, on the current status and the future prospects of offshore wind energy in Germany. The presentation was held at the 16th Wind Integration Workshop in Berlin. The Baltic Sea Declaration seeks to accelerate the development of offshore wind energy (OWE) and to foster international cooperation in the Baltic Sea region. The declaration acknowledges the potential of OWE for the cost-efficient achievement of the objectives of the EU Energy Union, to increase energy supply security and to further diversify the energy portfolio in the Baltic Sea region. However, to utilise the full potential of offshore wind energy and to develop a well-functioning integrated energy market, regional cooperation in maritime spatial planning, grid development, capacity planning and support schemes is needed. Introductury presentation about the realisation process and the success story of the first offshore wind farm in German waters: "alpha ventus". Sebastian Boie, Press Officer of the German Offshore Wind Energy Foundation, on the importance of offshore wind energy for the German energy transition. The presentation was held at the IKEM "Summer Academy 'Energy and the Environment' 2017". During the Offshore Wind Energy 2017 in London this Joint Statement on the development of offshore energy in europe was signed by government representatives of Denmark, Belgium & Germany as well as leading industry representatives. Andreas Wagner, Managing Director at the German Offshore Wind Energy Foundation on the industry's persepective on offshore grid development. Last year, 156 new offshore wind turbines with an overall capacity of 818 megawatts fed their power into the German grid for the first time. This brought the total number of turbines on grid by the end of 2016 to 947, with a total capacity of 4,108 megawatts. In all positive figures according to the Working Group for Offshore Wind Energy (AGOW), the German Wind Energy Association (BWE), the Offshore Wind Energy Foundation, VDMA Power Systems and the WAB Wind Energy Agency. The amount of power generated by offshore wind turbines was around 13 terawatt-hours in 2016. This represents an increase of almost 57 per cent compared to the 8.3 terawatt-hours generated in 2015. This consolidates offshore wind power’s position in the German power mix, supplying around 3 million households with electricity.